Customize your wheels with four, chrome plated caps featuring the Kia logo on each. Received the order for our new 2016 Kia Sportage. The carpet floormats fit perfectly, attach via the factory attachment points, and have the name "Sportage" on them. They are of good quality and we are very happy with them. 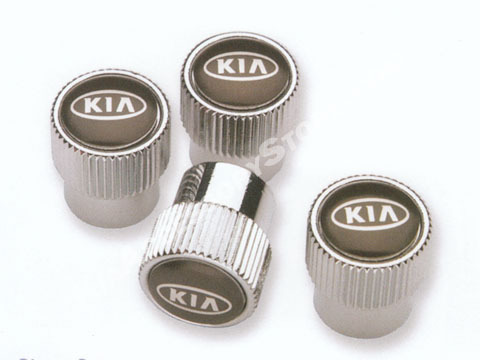 The "KIA" valve stem caps add a touch of class and are also of good quality. The license plate frame is of exceptionally high quality, is substantial in weight and construction, and also fits perfectly. These are not the only items we have purchased for our new KIA (first KIA we have owned), and we would say that if you want to be sure it fits right, is of good quality, and complements your KIA, then the KIA Accessory Store is the only place to shop! after just 3 years they crumbled and could not be stewed back on had to throw them away. Costco tire center stated they could damage tire pressure sensors with there deteriating metel in the valve stem.